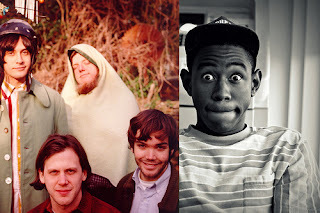 MP3: Neutral Milk Hotel x Tyler, The Creator - "Communist Future"
Just when you think you can't get any more Odd Future music you find more surprises. This song actually isn't technically new as it is a mash-up of "Yonkers" and a song by indie band Neutral Milk Hotel. This strangely unique pairing actually works quite well together. Track is titled "Communist Future." Yet, just when I thought that was not crazy enough Confusion over at Pigeons & Planes dug even further and found another crazy mash between those artists. Tyler and Earl's "Assmilk" and is combined with Neutral Milk Hotel's "King Of Carrot Flowers Pt. 1." It is definitely something you want to hear. Track is appropriately titled, "King of Assmilk Flowers." You can listen to both tracks and download below.